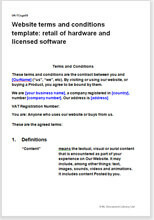 This template is an adaptation of our website terms and conditions template for an online retailer, suitable for companies whose products package hardware and software together. The retailer will have developed the software, but may or may not have developed the hardware. In legal effect, the T&C govern the sale of hardware and a grant of licence to use the software. software houses selling compatible third party hardware for their software. developers of contactless payment system software that requires particular hardware to operate. Neither the hardware nor the software sold on your site should created or customised to unique specifications given by the customer. In other words, it should be a standard product (or products) available to all visitors. The software should be sold in hard copy and packaged alongside the product, not as a separate download. Website terms and conditions template: international sale of goods to business is suitable for a retailer, wholesaler or manufacturer that sells goods to businesses only. The terms and conditions are valid for businesses based anywhere in the New Zealand.